Gargoyles. The rose window. Victor Hugo’s hunchback. Flying buttresses. These are just a few of the countless reasons why Parisians and visitors to the City of Light visit and fall in love with Notre Dame de Paris, the stunning gothic cathedral that often is included with the Eiffel Tower and the Arc de Triomphe as iconic symbols of Paris. But for Catholics, indeed for all Christians, the church also is host to one of the most important relics in all of Christendom—the Crown of Thorns, allegedly worn by Jesus during his crucifixion. And a quick note on the use of the word “allegedly” here: No one knows for sure how many Christian relics are authentic, or if any of them are at all. Indeed, there are so many purported pieces of the “True Cross” collected and displayed around the world that together they’d form multiple crosses. 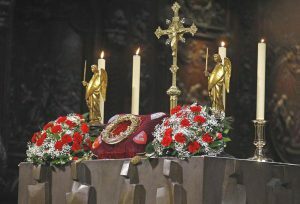 Nevertheless, for the faithful, these relics are considered divine, and draw pilgrims from across the globe. And most are historically significant in and of themselves, regardless of one’s faith. 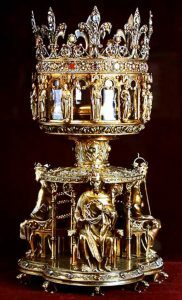 In Paris, there are three holy artifacts housed in Notre Dame’s reliquary: One of the above-mentioned pieces of the True Cross; one of the Holy Nails, purportedly used to nail Jesus to the cross; and the Crown of Thorns. So how did the City of Light and not, say, Rome end up with the crown? As part of a 13th century effort by the Latin Emperor of Constantinople to shore up Catholic support for the newly formed empire that was established through the capture of lands during the Fourth Crusade. The Latin Empire was intended to function as an eastern arm of the Roman Empire, and the newly minted Catholic emperors there were desperate to secure support from Europe’s other Catholic figureheads and rulers. At the time, the crown was housed in Venice and held as collateral for a large loan made to the Latin Empire. In 1238, Emperor Baldwin II offered the crown to France’s King Louis IX in exchange for France retiring the loan. Louis eagerly accepted and ordered the building of the gorgeous Sainte-Chapelle church on the Ile de la Cite, completed in 1248, to house the relic. During the French Revolution, the crown—and the other religious relics—were first relocated to the Abbey of Saint-Denis, the cathedral that serves as the burial site of most of France’s kings and queens, located in a northern suburb of Paris. Eventually the crown, piece of the True Cross and Holy Nail were moved to the country’s national library, mostly to guarantee their safe keeping during an era when many religious facilities and symbols were destroyed or repurposed for secular use. 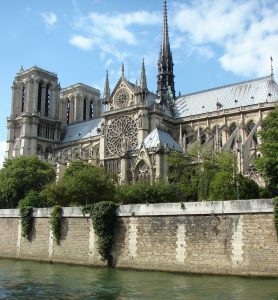 The Concordat of 1801, an agreement between Napoleon and Pope Pius VII, returned ownership of the relics to the church, and they were moved in 1806 to the reliquary in Notre Dame, the seat of the Archbishop of Paris, where they’ve been ever since. The crown is a twisted wreath of Baltic rush measuring 21 centimeters in diameter. Notably absent from the entwined reeds are any thorns, all of which were reportedly removed over the centuries and today are housed at many other holy sites throughout Christendom. 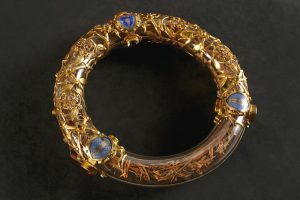 The branches are bound by gold threads said to represent the missing thorns, and this circlet is preserved inside a jeweled crystal and gold tube. The tube itself is housed inside a reliquary commissioned by Napoleon, which is protected inside the church’s treasury that is, sadly, inaccessible to the public. 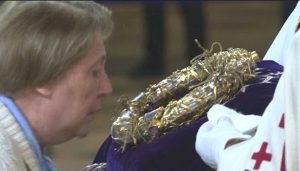 But the relic is presented inside Notre Dame’s main chapel every first Friday of the month, and every Friday during Lent, as part of a special veneration Mass. Additionally, the crown is displayed from 10 a.m. to 5 p.m. on Good Friday—today—to commemorate the day on which Jesus was crucified. Friday veneration masses are held at 3 p.m. and are open to the public, including non-Catholics, although only active church members are permitted to receive the eucharist during services. Church hours: Monday-Friday, 7:45 a.m.-6:45 p.m.; Saturday-Sunday, 7:45 a.m.-7:15 p.m. This entry was posted in Annual Events, Churches, Famous Paris destinations, French history, Ile de la Cite, Religion, Sight-seeing and tagged Crown of Thorns, Easter, Good Friday, Holy Week, Lent, Notre Dame by Bob Adams. Bookmark the permalink.